soooo on Sunday before my hair appointment i did a little shopping on our local street in San Clemente. this adorable street - del mar - has a ton of great restaurants, boutiques, salons & antique stores. Plus every Sunday they have a wonderful farmers market. 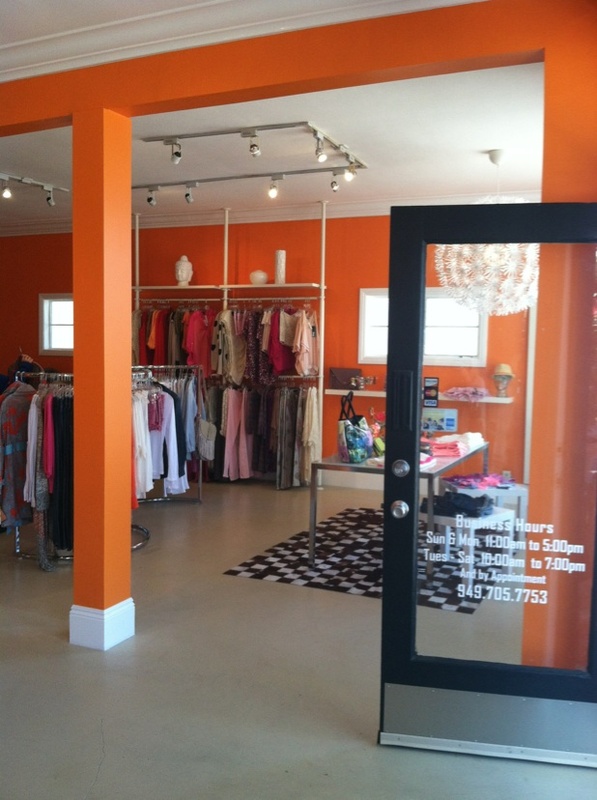 So while walking along del mar enjoying the beautiful weather I stopped in my step….I saw these beautiful orange colors coming from this place called Lincoln Street...i thought to myself; is this a new store? a new salon? i must find out! As I walked in I got very excited. It was a trendy new boutique! And everywhere I looked they had something I just had to try on. It was like everything that is “in” at the moment was in this store. 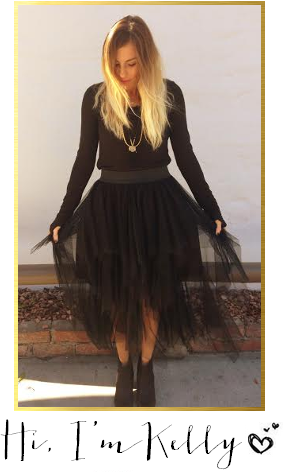 As I browsed the displays of clothing & jewelry I realized everywhere I looked they had such unique amazing pieces, not the typical merchandise you see every where…so I thought it would be fun to talk with the girl working & give us a little tour.....So without further ado meet Haley…. Pretty amazing right? and how cute is Haley?! I seriously wanted everything! Of course I did buy a few things…how could I not? 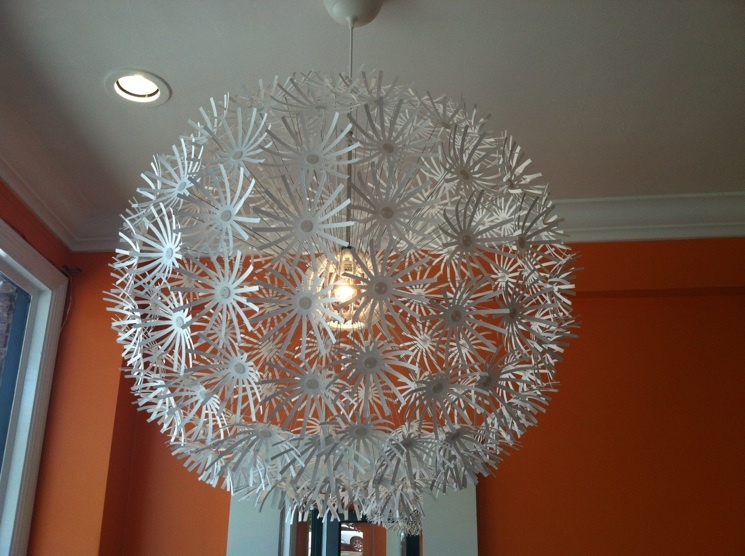 !…and here’s the best part – they have reasonable prices! nothing bothers me more than walking into a store & seeing that everything is $100 & over….we’re still in a recession here people! So I guess you can say my Sunday turned out even better than planned….found a new chic boutique, bought some great items, & got my hair done. 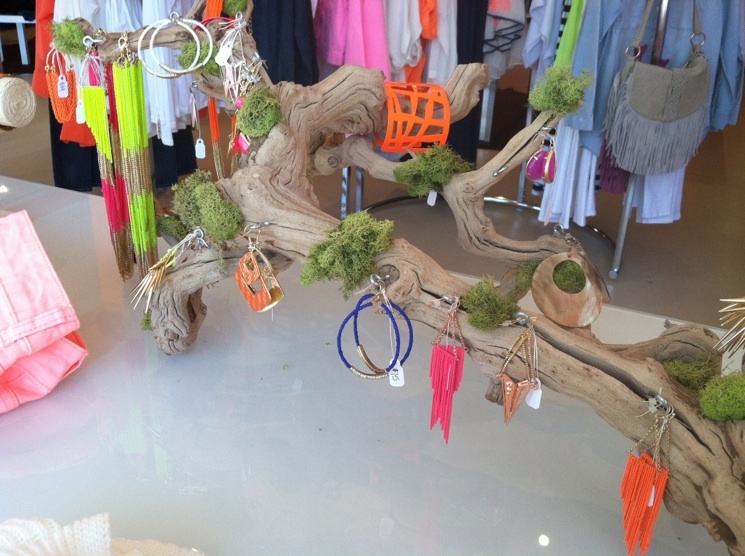 Here are a few pictures I took of the store & they’re fabulous neon display! so if you are ever in the area, i highly suggest taking a walk down del mar street & stopping in the Lincoln Street Boutique! sooo the winner of my vintage silver bracelets is comment #9 - Janna Bogert from Perception is Everything! YAY!!! i will be emailing you for details as to where to send these fabulous bracelets!! and THANK YOU to everyone who entered & who reads and follows my blog. It means everything to me. Fortunately for you I will be having another giveaway once I reach 300 followers....only 36 more! and since MAY is my BIRTHDAY month & I go big for my birthday no matter what age, I will be having fabulous giveaways that consists of my favorite stuf all month...& if you know me, you know I like nice things....so stay tuned! tell me you bought those neon peach pants! they are amazing! What an adorable store! I want a cross on my nail too! I love the bright colors of the wall too!!! 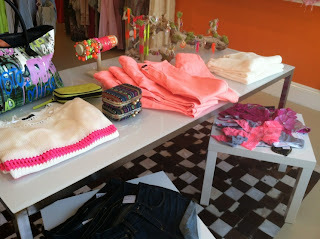 I love finding cute new stores, more than anything! Especially when they're affordable. My area is seriously lacking in cute stores & boutiques like this so I'm very jealous! 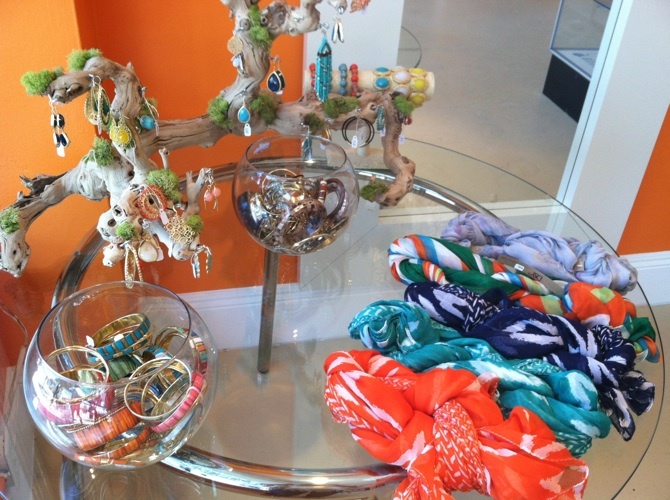 I think I started drooling over the jewelry display - I want it all! 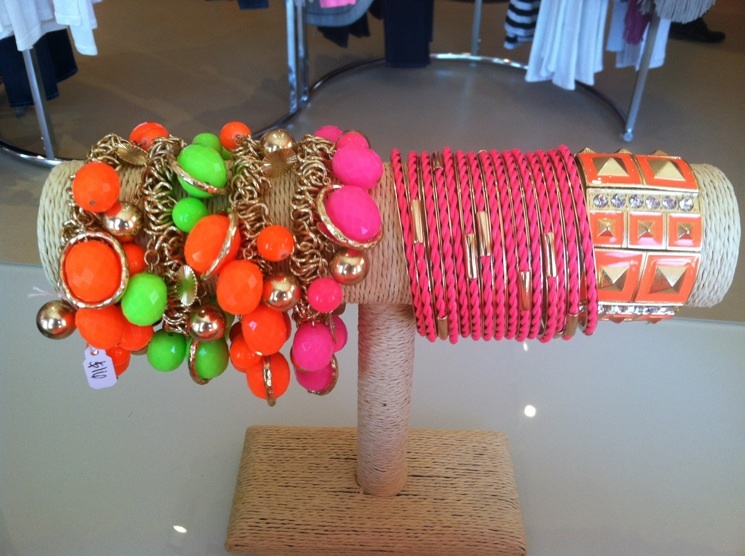 Love all the neon accessories you featured!! So fun for spring/summer! AH! We seriously HAVE to get out of our dinky little town and move somewhere with shopping like this! Cal Ranch is as good as it gets in my little town.... poor me! HA! I love that cute little store! And I'm loving all the Neon. Makes me excited for Summer! I wish we had more cute boutiques like that. JEALOUS. I love finding new fun stores, and it looks like you really found a great one here, always a delightful way to spend a Sunday! If only I lived closer! That store looks amazing! I like that sweater (the first one she held up), it is so cute for the summer! Thanks for sharing! I love the accessories! they're all pretty! I wish I live closer to that store! Have I mentioned how excited I am that I won!? Yeah...sorry. That store sounds awesome! I love those colors, for sure!